For National Poetry Month I put up this interactive display using brown packaging from shipments to the library and green paper leaves. I posted a few “how to” information sheets for haiku, acrostic, and rhyme. Patrons were invited to write a poem on a green leaf OR write the name of their favorite poet or poem on a leaf and give the leaf to a staff person to hang up. The tree was fairly bare most of April, but once we got a few up there, more and more have been trickling in. 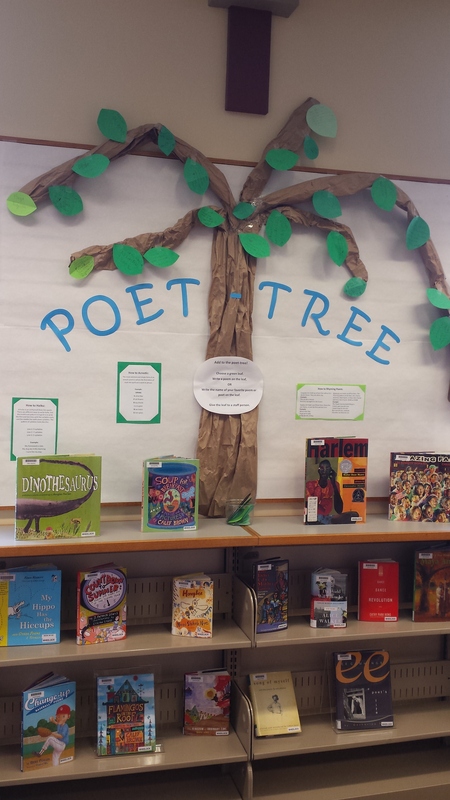 Poetry books are displayed below the tree. How did you celebrate April? Categories: Other Library Stuff | Tags: library display, poetry month | Permalink.